The Petroleum Sorbent Spill Response Pack SRP-Petro will "sorb" hydrocarbon based liquids and repel aqueous based liquids. 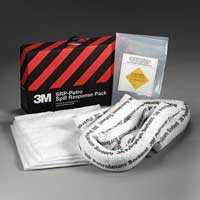 3M Occupational Health & Environmental Safetyum Sorbent Spill Response Pack SRP-Petro will "sorb" hydrocarbon based liquids and repel aqueous based liquids. The pack is encased in a cardboard box that can be used as a warning sign and includes both mini-booms and pads. This spill pack has containment bags and ties for temporary storage of materials to be disposed of. SRPs are packaged 3 per case with a weight of 17.5 pounds per case. Each petro pack will absorb 5 gallons.